You would think that we are too old for a sticker chart, rewarding us for desired behaviors with a shiny, colorful star. You would be wrong. I started with the red/orange stars to keep track of middle schooler’s instrument practice time. 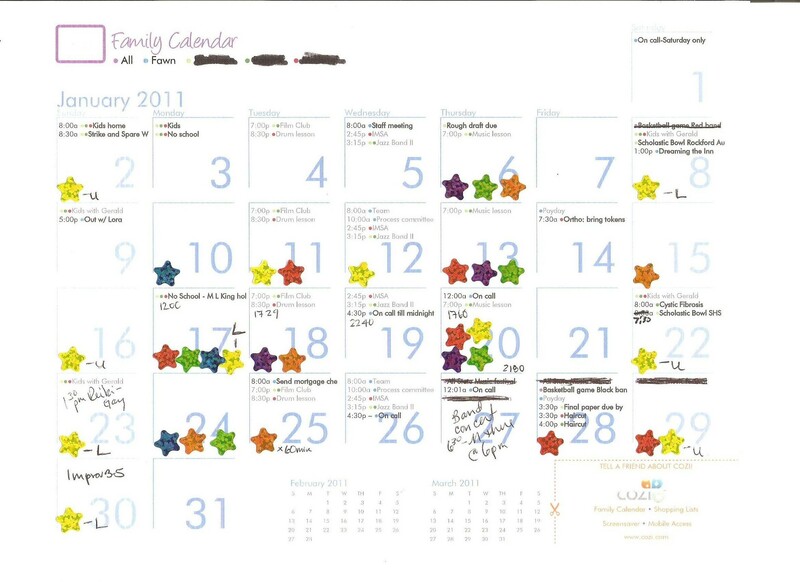 Then I added the yellow stars to keep track of my workout days. At first, I was discouraged that there were so few yellow stars, but I began to see a pattern to when I don’t make it (I need to drive the kids to school-too much snow to ride bikes, or I’ve been on-call the night before) and that actually encouraged me. I’m not just lazy….I’m busy and responsible. My goal for the month of February is to have a yellow sticker three times per week. The green and blue stickers represent daughter and middle son’s music practice. They scoff at my chart, but I have noticed a friendly competition between them, so I think it encourages them too. 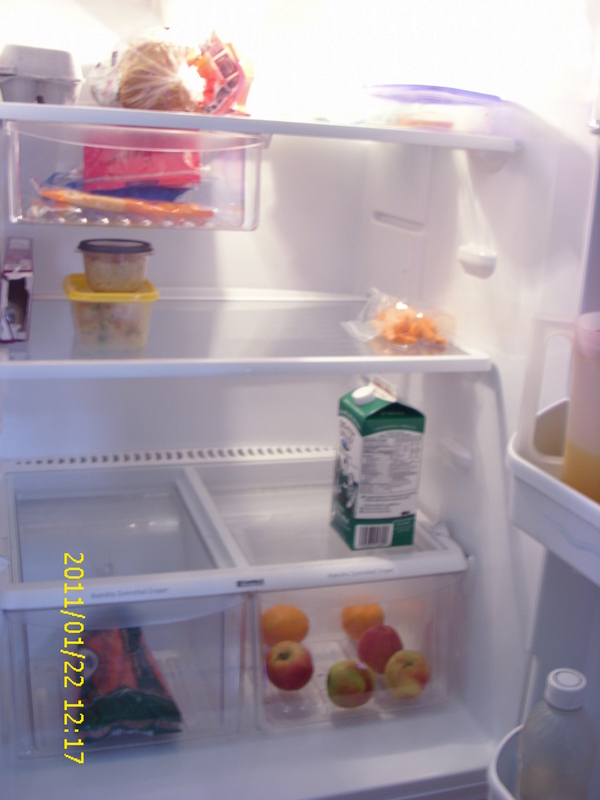 As part of my budgeting our food costs within the food stamp allotment, we cook and eat most meals at home. It doesn’t take a lot of fancy kitchen equipment to get basic meals on the table. 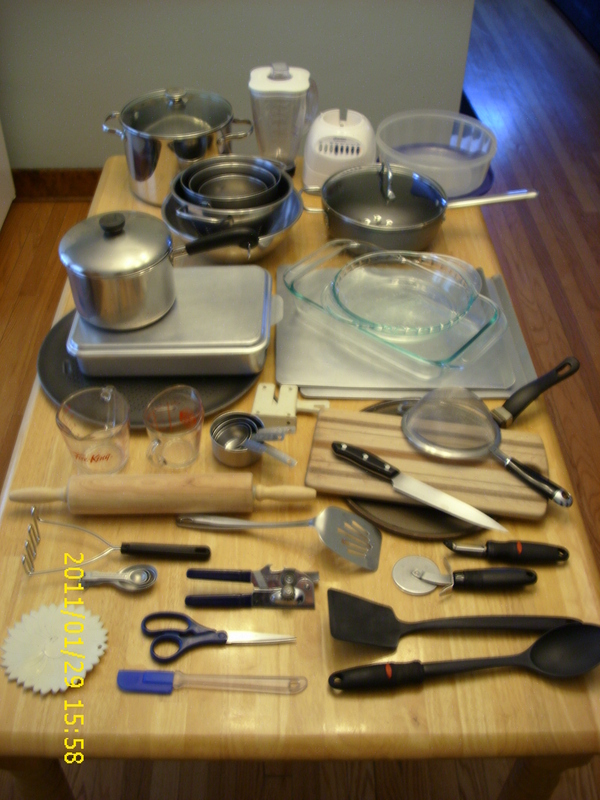 Here is a photo of all of my food preparation equipment. And the blender really only gets used 1-2 times per year. 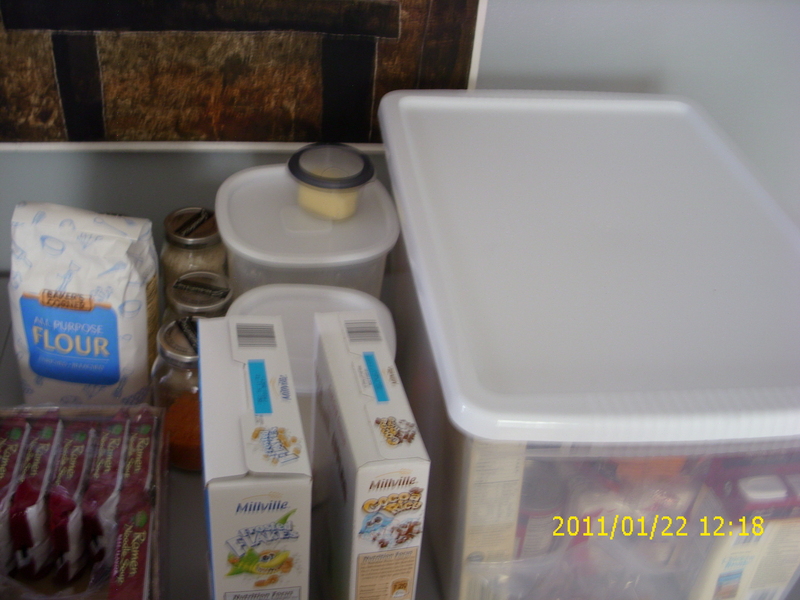 With just a little creativity, I could get rid of one of the 13″x9″ pans, consolidate the cookie trays and pizza pan, get rid of a couple of the mixing bowls…. My point being that you don’t have to have the dream kitchen to create tasty and healthy meals. Last night I was at a Middle School music concert with choir and jazz and concert bands. I loved it. There were a couple of painful moments…like when the 7th grade soloist’s voice broke, when the 8th grade back up singers started in on the wrong part…but this is the whole point…..kids learning performance. It’s not perfect the first time. My heart soared when they got it right and sunk when they did not do as well as they expected…and you could read it on their inexperienced faces. What surprised me (though it probably should not have) was how many of the audience were not really present. There was the dad to my front and left who worked a crossword puzzle the entire time we were there. There was the teenage brother, so cool, with his ear buds, enjoying a different music. There were several parents/grandparents so busy with the video/photo shoot that they could not possible have noticed the actual performance. But maybe they will enjoy the recording of it just as much as the real thing. I have stopped carrying a book to read “in line” or at the auto dealership. I have stopped trying to mentally transport myself to another place when I find myself in unpleasant circumstances (some would count a beginning band concert here.) I am beginning to learn to just be in the place and time that I find myself. It is not always “fun,” but it is always interesting, and I learn so much it is worth the inconvenience. How about you? What is a hard circumstance for you to just be present? I confess, social chit-chat with the kid’s dad after the performance was hard. Darn it. Still. I was talking today with a male acquaintance who told me that he had just completed the laundry for his family of five, including arranging the closet of his seventeen year old daughter by putting like with like: short-sleeved shirts arranged by color, long-sleeved shirts arranged by color, pants arranged by color, etc. I am in awe and wish he would come over here to arrange things. I mentioned this at dinner and my sixteen year old daughter said, “Why? I do that with my clothes.” I had no idea…. you see at my house, when you turn twelve, you get a lesson in how the washer and dryer work and then you are responsible for your own clothes. I didn’t know how my daughter arranges her clothes, because frankly, other than buying some new ones from time to time, I haven’t had anything to do with them. It’s not always easy to do this. My twelve-year-old moves his dirty clothes from the laundry basket into the washing machine to the laundry basket to the dryer to the laundry basket where they remain until he plucks them out to wear them to school. He is a wrinkled mess, but at least he smells clean. 🙂 I’m hoping that when he discovers girls that the wrinkled mess will finally get folded and put in the dresser….but until then, I am willing to cringe and look the other way. I think that the kids learn valuable lessons in this: how to do the laundry, how much time this essential task takes, with no planning you find yourself wearing the same smelly gym shorts to school for the third day….that kind of thing. And there are important lessons for the recovering perfectionist mom (me) too. For example: being a good mom includes letting your kids fail in small ways (wrinkled clothes) so they can succeed in big ways (responsibility for one’s self) and people who judge you because you don’t meet THEIR standards are soooo not worth your time. And, BONUS, when you let the kids wash their own clothes, you free up time for helping them with their homework and driving them to the next athletic event or a home cooked dinner. I believe there are two main types of parents in the world: the potters and the gardeners. Potter parents envision their child as a piece of clay that needs skillful handling to make it become a beautiful pot. This involves the shaping of the clay, wedging (the process of slamming the newly mixed clay against a hard surface to knock the air bubbles out. Air bubbles will cause a clay object to explode in the kiln) firing and sometimes glazing. For the potter parent, there are a lot of things that can go wrong in the process, and most of them reflect his/her skill. Then there are gardener parents. A gardener parent believes each child to be a seed. Could be an oak seed, a daisy seed, or a grass seed. Each beautiful in its own way, each requiring different conditions for optimal growth. The trick is, you don’t know what kind of seed you have when you start. The gardener parent puts his seed in the ground and waits to see what sprouts and how it responds to the current conditions. Then she adjusts the conditions and waits to see how the sprout responds. Both kinds of parenting are hard work, the main difference, I suppose is trust. The potter parent believes it is only the environment of the clay that molds it, while the gardener parent believes that the seed knows what it is meant to be, and there is a dialog between the gardener and the fledgling plant that create optimal conditions for growth. In case you can’t tell, I’m a gardener. 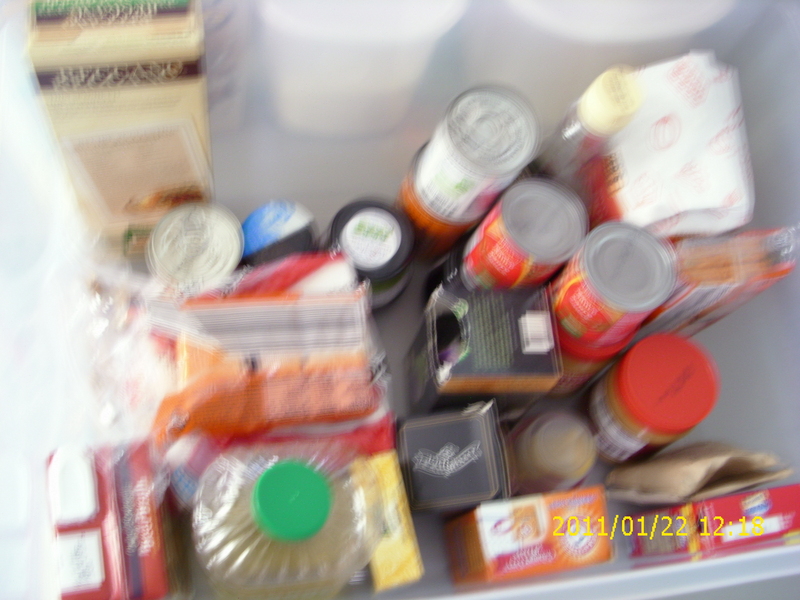 And here is the “pantry.” Remember, during the kitchen remodel all this stuff is on a folding table in the dining room. Here is the post in which I give you an extra 2 hours/day. TVs have been getting cooler and more sophisticated each year: flat screen, high-definition. Unfortunately the programing isn’t any cooler or more sophisticated than it was ten years ago. But, still, it draws you in, sits you down, puts a remote in your hand and next thing you know, you are waking up on the couch with a crick in your back to drag yourself upstairs to bed, where you can’t fall asleep. We’ve all heard the statistics that the average American watches 4-5 hours of TV per day. And, yeah, we all know you are watching the History channel and Discovery and PBS not Mad Men and Lost. 5) do NOT put comfortable chairs/couches in front of the TV. Make TV watchers sit on the floor or some hard metal folding chairs borrowed from the church, or the broken office chair that tips over if you don’t balance perfectly. 6) cancel your cable or if you just can’t go that far, reduce it to the most basic package. 7) if there was a way to set the thing up like the airport TVs or a laundromat dryer, where you have to put in a quarter for the next 10 minutes, I would wholeheartedly recommend that. 8) make ’em (yourself) work pretty darn hard to watch and you won’t watch as much. Level III: No TV in the home. You will not have to go without. I swear. I have not had a TV in my home for the past 10 years, and I see a little bit EVERY SINGLE DAY–at work, at the dentist’s office, at restaurants. It is ubiquitous. And if there is some really cool show that you can’t live without, you can watch a lot of TV online (though this totally defeats the purpose of giving you time back) or rent the whole season from Netflix. Bonus: when I had to write a note to the teacher, excusing them from the assigned homework, which involved watching something on TV, ’cause we didn’t have one. They were positively gleeful, I tell you. I’m not saying that you have to give it up forever….but try it for a month or 90 days, and see if you don’t like the flow of your life a little better. It is there, I swear it is…..you just haven’t been looking. You’ve been told (along with the rest of us) that single parenting is hard. So you gird up your loins, and prepare for battle with your kid’s teacher, with your ex, with your mother, with whoever is not supporting your choices. Well…..Blllllpppp to that! Every stage of parenting has its joys and drawbacks. Focus on what is fun NOW. Did you hear me? Focus on what is fun NOW! Dinner is still fun. Tonight the high schoolers were conjugating Latin verbs that sound like English swear words. (OK, we are geeks.) Example: facio, facere, feci, factus (do or make) : facamus, facar, facere… you get the idea. Your turn. What is fun with your kids now? Post in comments. Your first comment won’t be posted till I approve it, after that, comments will post as soon as you approve them. Prevents spam. As most of you know, I have the goal of owning only 100 things, but for now must be content with 100 personal things, and count the things I share with the kids separate. It’s not really fair to make them live in a house without furniture, just because I’m quirky…..
Last count was 92 personal items, and when you get to this few objects, it takes a fair amount of creativity to reduce it further. Of course, that’s half the fun. I am intending to find a way to live without purse and wallet and the biggest obstacle to this goal is there is so much women’s clothing without pockets. Since I own so few clothes, it shouldn’t be that hard to make sure that I only purchase clothing with pockets, right? Well, sorta. I like skirts and dresses and most of them come without pockets. SIGH. 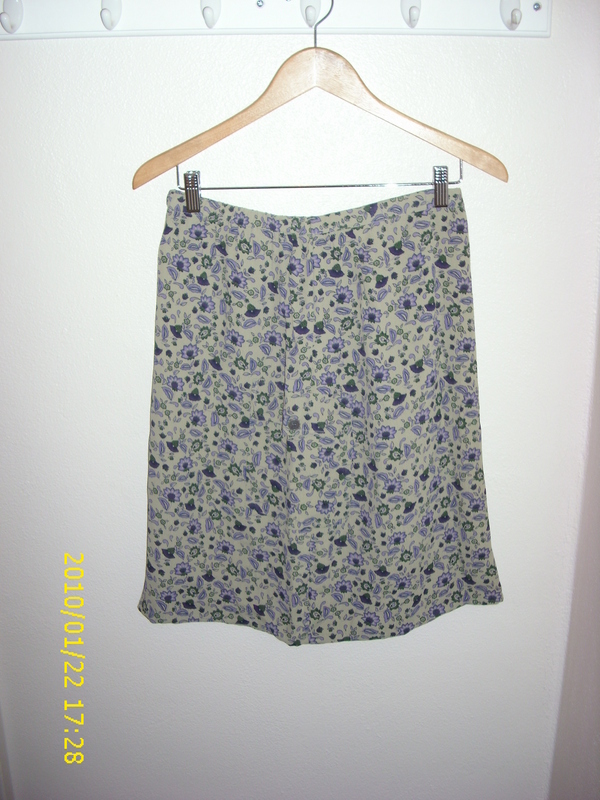 Here is my new work around: Goodwill has lovely mid-calf skirts with a nice drape and feel to the fabric. Many of them are labeled “Dry Clean Only,” but for $3.00 a skirt, I can experiment. 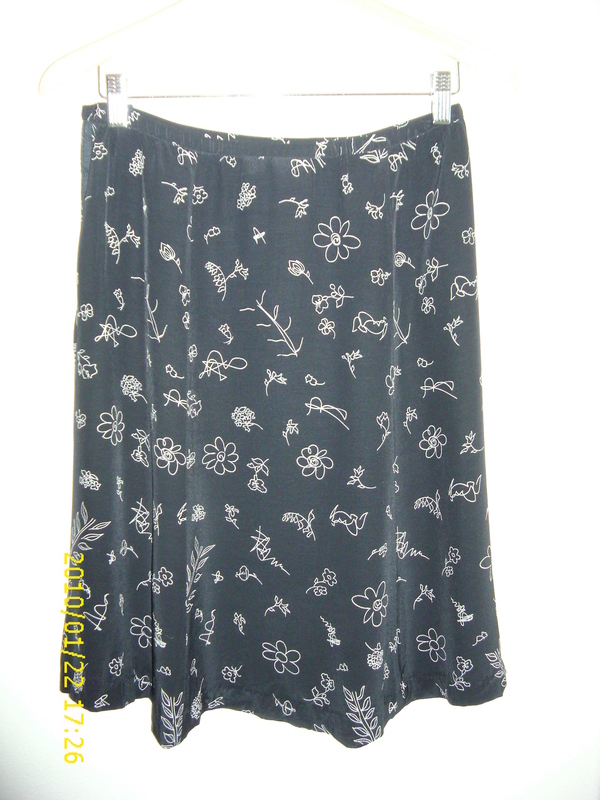 I select a skirt for the fabric, if it’s in my size that’s bonus. If it is bigger, I can cut it down. Then I wash it to see if the fabric will tolerate it. If it does, I shorten the hem to mid-knee, a more flattering length for me anyway. 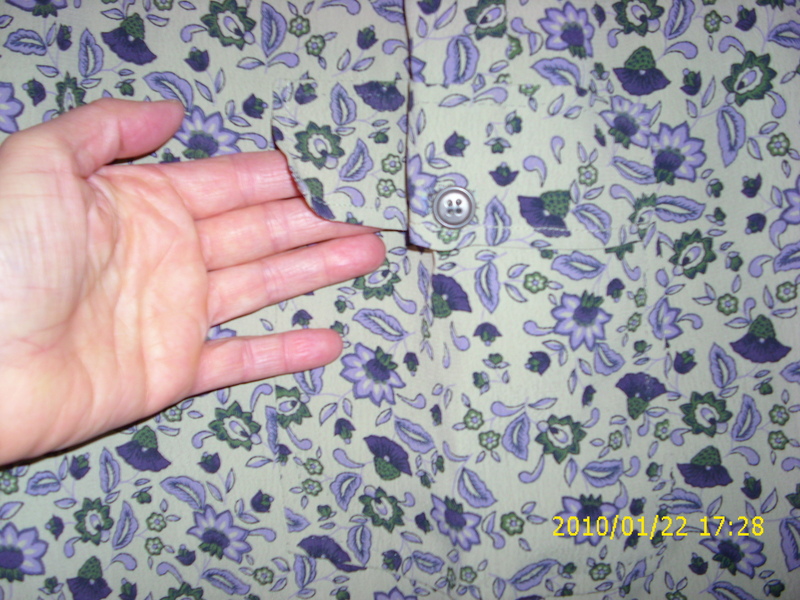 I save the fabric that has been trimmed off and use it to make pockets. So far, I have made two kind of pockets: side seam pockets and cargo pockets with a top flap. I think the cargo pockets are more secure, and if I am going to put my debit card and cell phone in there, I don’t want them to fall out while I’m driving. Here’s one that I just finished, that I can wear this summer. Now if I can just figure out how to get that blasted date/time stamp off the camera. We are 1/2 way through the month and I went shopping today for the next week. Grocery total so far: $211.34. Eating out total for the month so far: $40.43 which includes my half of the brushetta that I consumed last Sunday, plus tip; a soda mid-week, when I thought I could not go one step further without caffeine; my daughter’s lunch out today while at a Scholastic Bowl tournament and a latte this morning while I was doing errands, just because. 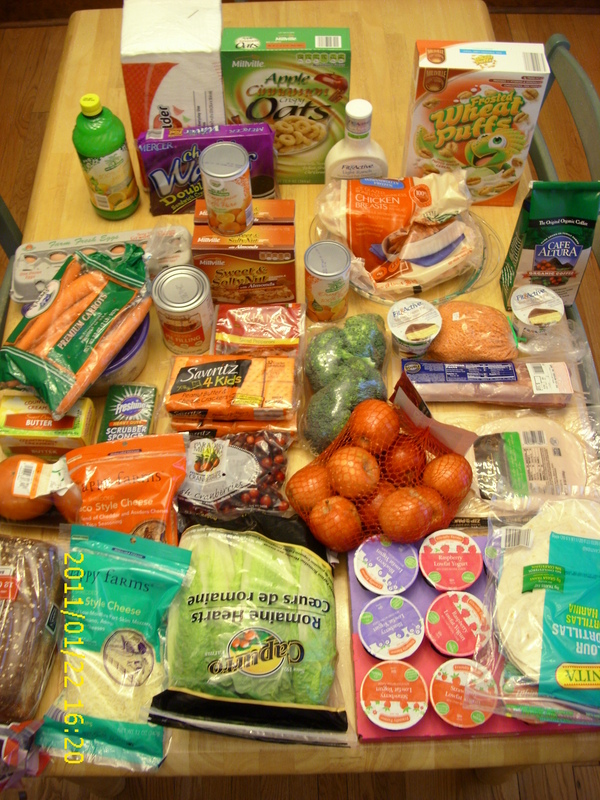 So….$251.77 with enough food in the house to take us through the 25th. $420 is doable if I stay away from Starbucks. Monday–Quiche and watermelon slices. Snickerdoodles for dessert. Wednesday–kids at dad’s house. I will eat leftovers. Friday and Saturday, kids at their dad’s. I will eat leftovers. Beef Stroganoff made with egg noodles, ground beef I had browned and frozen earlier in the month, beef stock and plain yogurt. Quiche makes use of a pre-made crust, organic eggs and pre-shredded cheese. Chili is made from scratch, incorporating more of the browned hamburger, lentils and canned black beans. The salmon fillets are purchased frozen. The rice pilaf will be made with plain white rice, more of the beef stock and some frozen peas I have on hand. I may put in some carrots too, if I get ambitious. As before, I will make some of the time-consuming dishes this weekend: Stroganoff, pilaf and chili, so at the dinner crunch hour I can whip things onto the table in 20 minutes or less.